Oftentimes, customers require one final push to overcome that last lingering bit of buyer hesitation, and in fact, some of the most useful strategies to use in this regard are actually the same content marketing tools you employed to get your prospects to engage in the free trial to begin with. Because SaaS products and their respective companies are fueled by the knowledge and information they provide, content marketing is essential to continue guiding customers toward becoming the promoters of your business that you crave. Although content marketing takes many forms, it’s imperative that you tailor your efforts to the objective of converting trial users into paid subscribers. Accordingly, some forms of content marketing -- such as search engine optimization, social media marketing and eBooks -- are less effective than others, as they are designed to drive traffic and build awareness of your product. Trial users are already past this point of outreach and require a more in-depth approach to yield positive action. This tried-and-true method of content marketing still applies here. Blogs are a great way to continue to provide value to customers regardless of their stage in the purchase process. After all, your comprehensive knowledge of the industry is what initially attracted users to your product, and it’s important to keep developing that relationship. These persuasive documents often aim to pinpoint the advantages that your product provides, and there’s no better time to offer such data to customers than during a free trial. Topics could highlight key features of your product and provide strategy tips for how it can help address common issues. Just allow whitepapers to demonstrate the might of your product, and it just may alleviate the need for sales calls and other outreach methods that target the same results. Personalized emails are a quick and easy way to connect with users upon sign-up and throughout their engagement with your product. In addition to illustrating attention to your customers’ needs, email communication gives you the opportunity to provide ancillary product information such as how-tos, highlight particular features and allow users to voice their questions or concerns to you directly, all while building a personal relationship. Like email marketing, reaching out to users directly through in-app messaging can be a beneficial strategy to establish an intimate connection. Careful timing for messages that inform users about product updates, touch base on how their free trial experience is going and provide other necessary information is key to putting this approach into practice. Few forms of content marketing create the kind of community that podcasting does. While podcasts are finally beginning to break into the mainstream, there are tons of podcasts that center on niche parts of the industry, making it the perfect venue for you to foster brand loyalty among current users as well as expand your reach to future prospects. Episodes could cover current topics within your industry or a peek behind the curtain on your business as well as incorporate customer testimonials. When it comes to making that final step from SaaS leads to paid customers, boosting the amount of interaction between you and your users is a no-brainer. For that reason, webcasts are perhaps more useful than most other forms of audio or video content. Broadcasting a tutorial or other how-to guide regarding your product gives you the chance to capture SaaS leads in an instant and resolve any questions that users may have, thus making them far more comfortable to sign up for a paid subscription. Though it may seem ironic that content marketing -- long a touchstone of the inbound marketing process -- plays such an integral role in maximizing conversion rates for free-to-paid customers, the benefits of this particular marketing strategy don’t simply end once a prospect has engaged with your product. 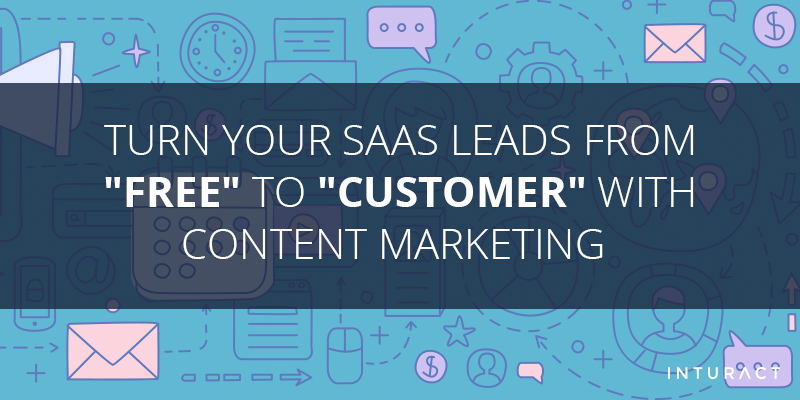 On the contrary, its ability to snag customers’ attention and keep your product top-of-mind is an invaluable tool that can be wielded to shape and mold their experience throughout the SaaS Marketing Journey. When applied in just the right way, it’s only a matter of time before your SaaS leads emerge as loyal customers and promoters of your brand, thanks in no small part to the careful implementation of content marketing.